Hand cymbal or manjira is a traditional hand percussion instrument of India. It is also known as manjeera, tala, jalra, khartal or kartal. Manjira has a significant importance in Indian folk music. Basically manjira is played in the aarti of Indian Gods & Goddesses for devotional music. Manjira in Tibetan style is known as tingsha which is a small for majira. 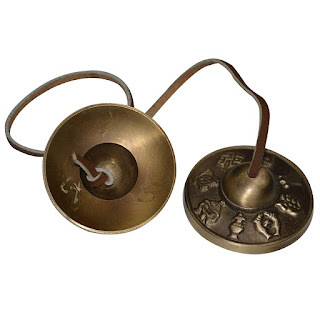 These cymbals used in prayer and rituals by Tibetan Buddhist practitioners. Two cymbals are joined together by a leather strap or cotton string. Manjira is mainly made of brass metal, but antique style cymbals are made from special bronze alloys that produce harmonic overtones. Though Manjira is a small metal instrument, but it produces a sweet tinkling sound when struck together.